This status report features the most recent developments in the field, spanning a wide range of topical areas in the computer simulation of condensed matter/materials physics. 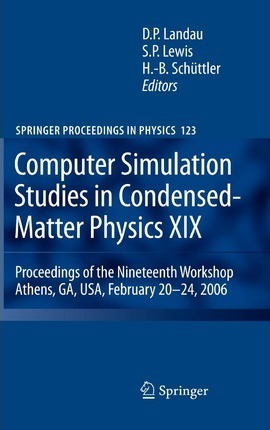 Both established and new topics are included, ranging from the statistical mechanics of classical magnetic spin models to electronic structure calculations, quantum simulations, and simulations of soft condensed matter. Illustrations note 3 Tables, black and white; VIII, 157 p.
This volume represents a "status report" emanating from presentations made during the 19th Annual Workshop on Computer Simulations Studies in Condensed Matter Physics at the Center for Simulational Physics at the University of Georgia in February, 2006. It provides a broad overview of the most recent advances in the field, spanning the range from equilibrium and non-equilibrium behavior in statistical physics to biological and soft condensed matter systems. Results on nanomagents and materials are included as are several descriptions of advances in methodology. Materials Properties.- Computer Simulation Studies in Condensed Matter Physics: An Introduction.- Accelerated Molecular-Dynamics Simulation of Thin Film Growth.- Simulating the Interaction of High Intensity Optical Pulses with Nanostructured Optical Devices.- Crack Motion Revisited.- Deconstructing the Structural Convergence of the (110) Surface of Rutile TiO2.- New Models, Methods and Perspectives.- Ensemble Optimization Techniques for the Simulation of Slowly Equilibrating Systems.- The Avogadro Challenge.- Visualizing Nanodiamond and Nanotubes with AViz.- Molecular Dynamics Simulations for Anisotropic Systems.- Event-by-event Simulation of EPR-Bohm Experiments.- Non-Equilibrium and Dynamic Behavior.- Fisher Waves and the Velocity of Front Propagation in a Two-Species Invasion Model with Preemptive Competition.- Dynamics and Thermal Structure of Gas-Liquid Phase Interface.- Rate Constant in Far-from-Equilibrium Open Systems.- First-order Reversal Curve Analysis of Kinetic Monte Carlo Simulations of First- and Second-order Phase Transitions.- Magnetic Systems.- Vortex Fluctuation and Magnetic Friction.- Simulational Study on the Linear Response for Huge Hamiltonians: Temperature Dependence of the ESR of a Nanomagnet.- Attraction-limited Cluster-Cluster Aggregation of Ising Dipolar Particles.- Biological and Soft Condensed Matter.- Simulational Study of the Multiple States in Hippocampal Slices.- Dissipative Particle Dynamics of Self-Assembled Multi-Component Lipid Membranes.- Solvent-Free Lipid-Bilayer Simulations: From Physics to Biology.- Computer Simulation of Models for Confined Two-Dimensional Colloidal Crystals: Evidence for the Lack of Positional Long Range Order.